My PICK OF THE WEEK is this Thursday, the Downtown Art Walk…and the featured art installation/event is Altervision 3-D Blacklight Experience. The Downtown Art Walk will be off the hook. The weather is getting warmer and new venues are starting to jump….Unlike most Art Walks, this one starts early but keeps on hoppin’ till late. So get downtown and have some fun. Spring time is here, baby!!! 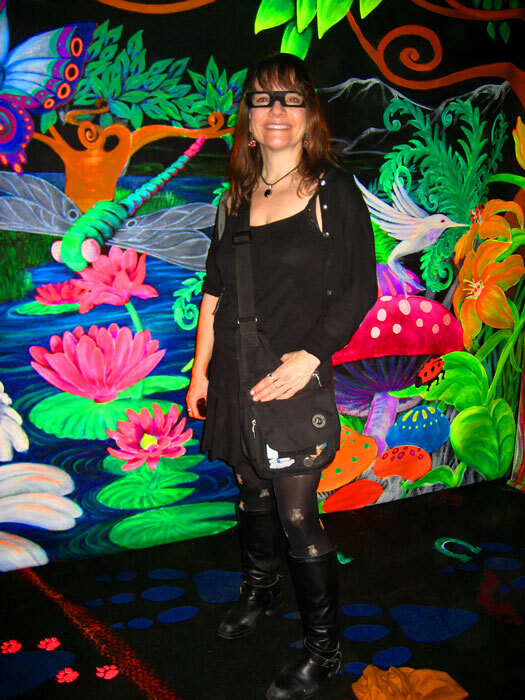 The Altervision 3-D Blacklight Experience is unlike anything you’ve ever experienced in terms of Art and of course without the use of mind altering drugs. Enjoy the experience of a three dimensional realm of “The Enchanted Forest” a “Deep Sea Escape” and “Koi Pond”, complete with fire breathing dragons and mesmerizing art pieces that float off the walls. Be aware that there is a charge of $3.00 for a one time visit and $5.00 for the whole evening. Believe me it is definitely worth it. See below for more info. Pix from last month. Are you up to some music? The Bruce Sanborn Band will be performing at Brennan’s Pub at 4089 Lincoln Blvd Marina Del Rey, CA 90292 this Wed from 8:00 pm till 9:00 pm. Great music, check em out! No cover. 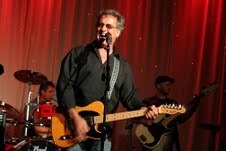 http://www.thebrucesanbornband.com/. Now that the weather is getting a bit warmer, if you haven’t checked it out yet, this may be a good time to bring the whole family. Santa Monica Place Mall offers the “Movies on the Deck” series. Tonight’s movie is Shrek- and once again will be held on the rooftop at The Santa Monica Place Mall. Bring the kids and the first 100 people to arrive will receive special SHREK ears (that’ll keep em quiet for about ten minutes) and a chance to win tickets to the musical at the Pantages Theater. This happens every Monday and Wednesday. Movies start at 7pm and yes it’s FREE, but come early if you want to grab a great seat. And bundle up, its outdoors, or bring your honey for warmth. There are heaters on the deck. You're welcome to bring blankets or your own chairs, but there will also be seating there. This free event and runs from 7:00 pm till 10:00 pm http://www.santamonicaplace.com/events/event.aspx?eid=29207. 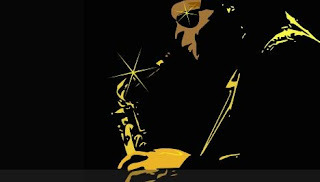 The Venice Bistro (323 Ocean Front Walk 90291) features classic rock with The Venice Street Legends who play every Wednesday from 5:00 pm till 10:00 pm. At Bistro gigs, they always go electic, with drums, keys and speicial guests. Happy hour specials and dancing. 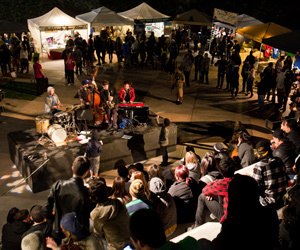 UCLA presents Jam Session, a new series, featuring FREE live music every Thursday in the Fowler Museum Courtyard with a reception and refreshments. This performance series features Jazz combos from the Herb Alpert School of Music and starts at 6:00 pm most Thursday nights. If you have never been to the Downtown Art Walk, this is something you have to experience. Very much like First Fridays on Abbot Kinney (in Venice), it has truly become a “scene”. Happening on the 2nd Thursday of every month, this event started on a grass roots level, only to evolve into a full blown art/night life extravaganza. Starting as early as noon, it doesn’t truly get going till 7:00 …it runs till 9pm or 10:00pm. Most galleries are gong later now. Some stay open as late as midnight. Art galleries, retail stores, restaurants, bars and empty lots are filled with every type of art, such as paintings, sculptures, glasswork, body paintings and photography. Everyone wants a piece of the action; bands come down to show their talent, crafts people sell their jewelry and accessories; you can see live painting with DJs and hoop dancing too. There is even a shuttle covered in graffiti art available to take you to another gallery. Gotta check out the Art Park at its new location….see info below. Now you may want to start or end at The Art Park, which has moved this month to 340 S. Spring St. The Art Park is joining forces with the Food Truck association which is always a popular place. So come with an appetite eat some tasty food truck grub while you enjoy the live music, DJ’s, artists and vendors. The Art Park is open till midnight. Now don’t leave without peering in the window of LACDA. 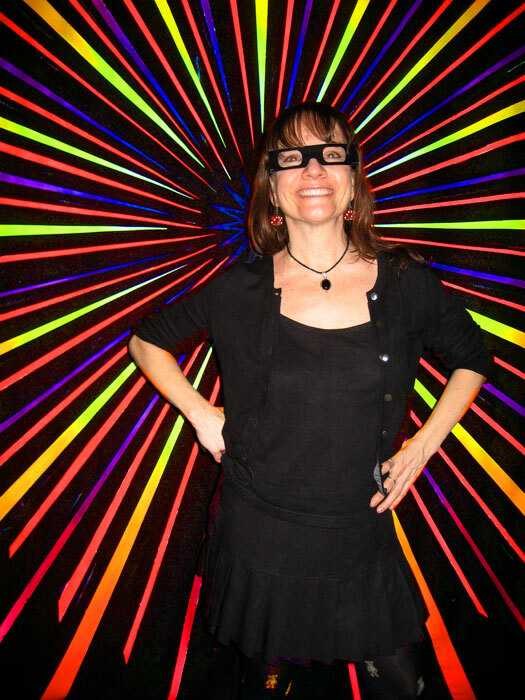 There you will see a brilliant light installation called SPECTRUM, by a wonderful artist named Andie Villafañe (on view till 5/11) A simply breathtaking exhibit. Photo by Paynie. 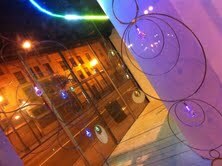 THIS IS THE FEATURED ART INSTALLATION.....CHECK THIS OUT!!! They did this for a couple of months now and it was such a success, they are doing it again. 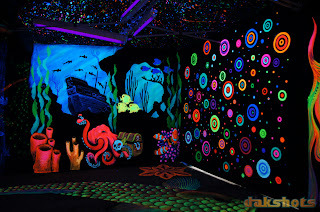 Experience Altervision 3-D Blacklight Experience. The hottest, mind blowing installation on this month’s Art Walk will be at the Medallion on 4th and Main from 6:00 pm till 10:00 pm. Be aware that there is a charge of $3.00 for a one time visit and $5.00 for the whole evening. Believe me it is definitely worth it… See pix from last month….this exhibit is super cool, (you even get to keep your 3D glasses). As you enter the black lit exhibit, you are surrounded by beautiful hand painted florescent murals by local artist Debi Cable. 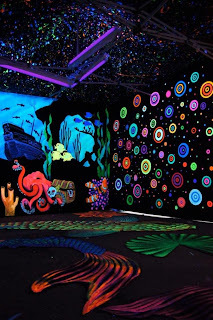 Enjoy the experience of a three dimensional realm of “The Enchanted Forest” a “Deep Sea Escape” and “Koi Pond”, complete with fire breathing dragons and mesmerizing art pieces that float off the walls, (no mind altering drugs needed here). www.facebook.com/Altervision3D. Another fun one is the Hive Gallery, which is celebrating their 6th year this month. I always feel very at home here. Located at 729 South Spring St, this funky gallery has a “Venice Beach” vibe and always offers live music and fabulous openings. On this special art walk night, Hive will be featuring two events, “The Best of the Hive show” as well as “New Avatars in Hiveland”. 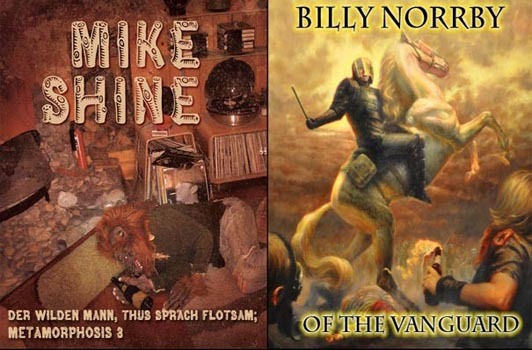 Curator Nathan Cartwright, created the Hiveland Book Project which encompasses his made up mythology about a parallel place called Hiveland (Mmm, what’s going on in his head?). 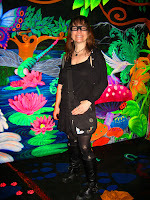 Every year artists are encouraged to create avatars that live in this land. This is the fourth year and Cartwright hopes to create a book entitled “A Field Guide to the Denizens of Hiveland”. There will also be music and an open mic…so bring your instruments and you chutzpa. 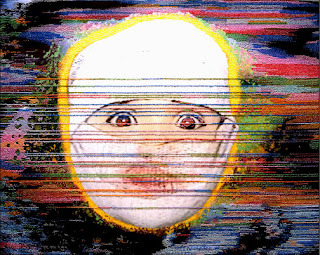 http://hivegallery.com/2010/. Even the Alexandria Hotel is getting into the act. This landmark Hotel boasts massive grand ballrooms from days gone by and many events have started to pop up here. Upstairs on the second floor, (The king Edward Ballroom), be prepared to enjoy the exhibit, entitled, “Door No.1”,an interactive Art + Music show by Rob Grad. “DOOR No. 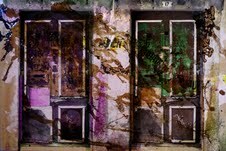 1” is Grad's interpretation of how we change and transform throughout our lives depending upon the "doors" we choose. There’s an art installation that you can walk through and Grad has written music specifically for this exhibit, which he and his band will be performing at 9:30PM. The event runs from 7:00 pm till midnight. Alexandria Hotel is located at 501 S. Spring St. http://www.robgrad.com. What I love about Downtown the most, it the majestic architecture of those historic buildings…such as the old Crocker Citizen’s National Bank Building which is now the very popular club, The Crocker Club located at 453 South Spring Street (5th St.) Los Angeles, CA 90013 (213) 239-9099. http://www.crockerclub.com/. You’ll want to have a martini here.When you go inside the club, at the bottom of the grand staircase; one catches a glimpse of a handsome mahogany bar that is reminiscent of other well known historic night spot gems, such as the Edison. How cool is it to be socializing inside an honest-to-God bank vault? Dubbed the Mosler Lounge, this unique bar lies behind a massive 1960s-era stainless steel bank-vault. Bunker Hill Magazine had their official opening last month of their affiliate gallery “GROUNDFLOOR” at 433 S. Spring Street, in the center of the bubbling –over downtown Gallery Row District. Group show, 6:00pm -10:00pm. http://www.bunkerhillmagazine.com. 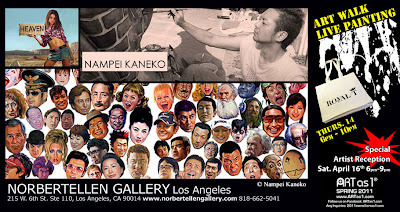 Mr. Kaneko earned him the name, “Hellpower Kaneko”, because of his dark style. In 2004 he created the extremely popular poster series for the fighting opera “HUSTLE.” He is currently one of the most sought after illustrators in Japan, yet his motto remains, “Have as much fun in life as you can!” ...and his works certainly reflect that sentiment. 10% of your purchase will be donated to "Save the Children", for the relief effort in Japan. 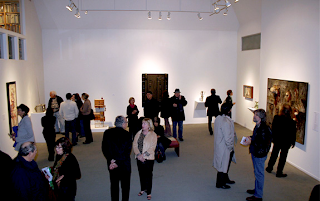 Norbertellen Gallery is located at 215 W. 6th St. #110. 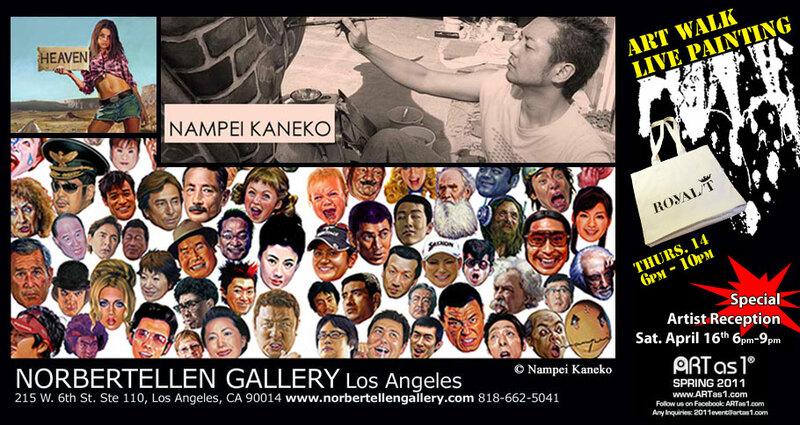 818 662 5041; www.norbertellengallery.com/. Cotrutza Gallery, a charming little gallery, will be featuring Claudia French's trees from the "Un-rooted" series, Acrylic on canvas, mosaic style. Cotrutza Gallery is located at 446 South Main St. This opening runs from 6:00 till 10:00 pm. 213-622-0121; http://www.cotrutza.com/. 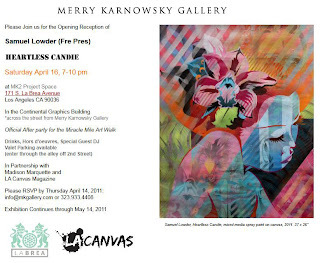 Crewest Gallery presents “Above the Radar” an urban art show featuring cutting edge graffiti and street artists. This event runs from 6:00 pm till 10:00 pm. Crewest Gallery is located at 110 Winston St. off Main, between 4th and 5th St. (213) 627-8272. http://www.crewest.com/. 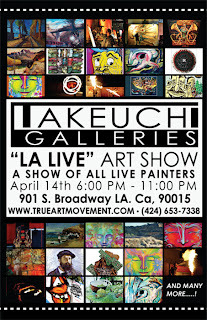 Takeuchi Galleries presents “LA LIVE” ART SHOW – A show of all LIVE Painters and Guest DJ’s. Food will be provided by Vees Cafe. http://www.veescafe.net. 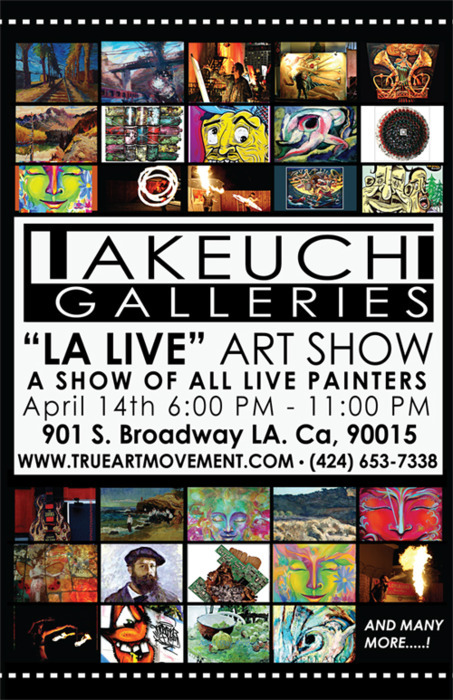 Curator, Derek Tadashi Takeuchi hosts this incredible live Painting event at the Blackstone Building. 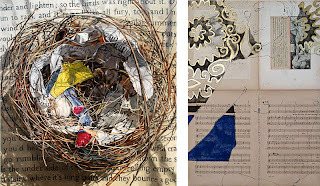 This group art show features various artists, with different styles, mediums and ages ranging from 24 to 77 years old as well as a vast range of price points. All Artists in this event will start off with blank canvases and create works of Art on location. Also work previously created will be on display as well. 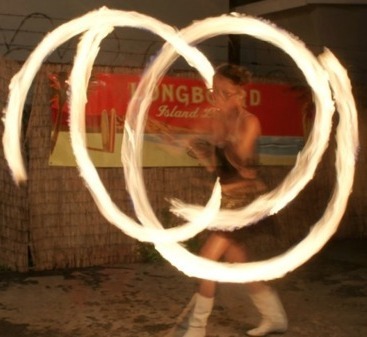 Matthew Caple and his Beautiful Belly and fire tribal dancers from “Soul Ignition” will be doing a “LIVE” Fire Show! Artists include: Conchita, Efrain Martinez, George Jacob, Melissa Leslie ”MLove”, Michael Pukac, Michael Craig Carrier, “Kiki,”Ray Kruger, Lark, Raymundo Gardea, Raul Arellano, Drika Dupetit, Robin Bott, Rob Padilla, “Rebornz,” Tony “Tee” Reyes and many more!!! 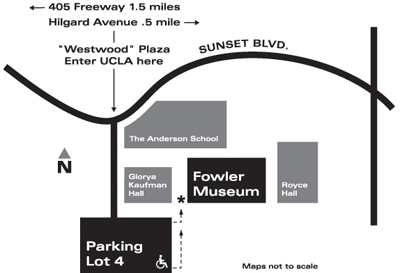 The Blackstone Building is located at 901 S. Broadway L.A., CA 90015, 6pm – 10pm. http://takeuchigalleries.tumblr.com/. If you still have the stamina, there are some other fun events happening off the main strip, that you may want to stop in. See the Groovaholix Dance company at the Great Art Factory (1201 S. Grand Ave., Suite B). For more info: http://www.soterik.com/. And Allison Torneros & Whorechata Art show will be featured at Yojie Japanese Fondue and Sake Bar located at 501 W. Olympic Blvd. Live DJ sets and drink specials too. http://allisontorneros.com/; http://willowiswatching.com/; http://www.yojie.com/; free parking for 2 hours. If you stay in LA, you can always pop over to The Talking Stick Coffee Lounge where Venice MoZaic will be celebrating their 100th month….Holy Cow! Can you believe that? Also DJ Noj will be celebrating his 40th Birthday too. Rummy Designs has an amazing Fashion Show planned especially for this evening. One of the great Poets of this Generation, Mike, The Poet is the featured artist along with guests Freddy Gins, Dakota Lee, Carol McArthur and many more. Its all happening at The Talking Stick Coffee Lounge 1411 Lincoln Blvd Venice 90291 from 7pm on. 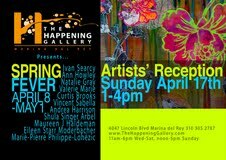 The Happening Gallery is having a Sunday afternoon opening reception of the group show, entitled “Spring Fever”. The event runs from 1:00 pm till 4:00 pm and the address is 4047 Lincoln Blvd. at Washington Blvd in Marina Del Rey.